There are two types of air filters in a vehicle. The cabin air filter ensures the air you are breathing is clean, and the engine air filter does the same for the engine and its components. While the former might be more noticeable to you, the latter is essential to your vehicle’s health. What does an engine air filter do? In order for the engine to create power, fuel and air are combined, compressed, and ignited in the combustion chamber. The engine air filter’s job is to ensure that no debris or abrasive particles such as dirt, dust, and pollen make their way into the combustion chamber during that process. Debris that enters the engine can cause premature wear on components such as the pistons, cylinder walls, and more. Damage to the engine can bear significant costs, which is why a little preventative maintenance goes a long way in saving you time and money. Can a dirty engine air filter affect performance? 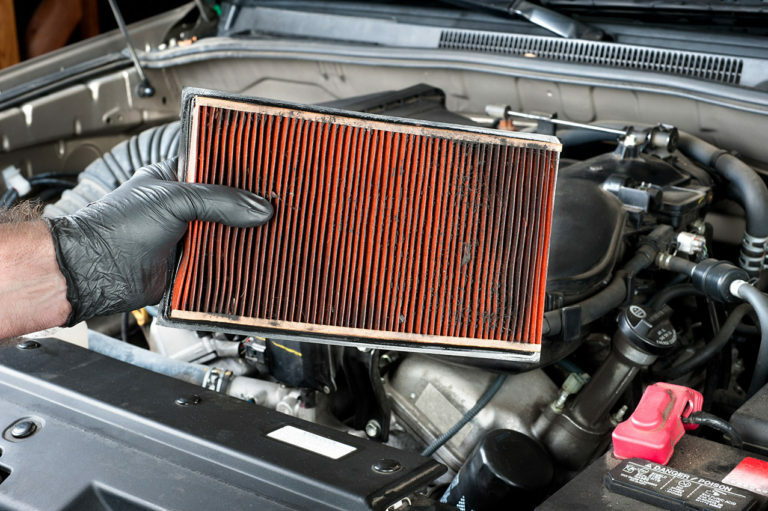 Performance problems also arise when the engine air filter gets too dirty. The filter must allow a high volume of air to enter the combustion chamber in order for maximum efficiency in the combustion process, and that becomes more difficult to maintain as the filter becomes clogged. When the rate of air flow is reduced by a dirty filter, the mass flow sensor on modern vehicles will reduce the amount of fuel being injected in order to maintain the precise fuel-to-air ratio needed by the engine. This can decrease acceleration by over 10%. In addition to the loss in performance, older models can also experience a loss in fuel efficiency. How often should an engine air filter be replaced? Engine air filters should be inspected regularly to ensure their effectiveness isn’t compromised. This can be done during any visit to a AAA Car Care center. An air filter may be good for 15,000 miles or more between changes, but it depends greatly on your driving conditions, which is why they should be checked often and replaced as necessary. Having the engine air filter replaced during other routine preventative maintenance, such as an oil change, is easy and ensures that the filter never begins to affect performance. Make an appointment to have yours checked today. Our 30 plus AAA Car Care locations across the Carolinas are here to serve both AAA Members and Non-Members for all of their car care needs. Our Members save on select repairs and labor costs, including a 2 year/24,000-mile warranty and a 10% discount on repair labor (up to $50). Book any of your car repair or maintenance needs today. Find great Car Care Coupons and more!